The long hours of working with multiple cameras, the very long nights editing hours of footage when everyone sleeps warm in their beds and creating something from nothing. We want to push ourselves to succeed and make our clients feel thst they have come to the right people. 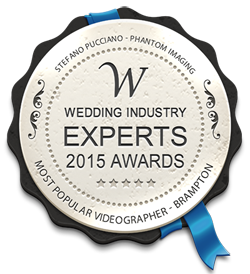 Phantom Imaging has been voted 1st Place in brampton for Most Popular Videography Company as judged by the 2015 Wedding Industry Experts Awards! Stefano (Founder) believes in one thing when it comes to filming any project. "Create a product that expresses your creative ability to make your message or moment remembered". From the moment we hear your vision, our team starts to put all the pieces together in a structured plan that will ultimately create our goal. There is no budget to large or small and this is somthing that we feel is key to success.